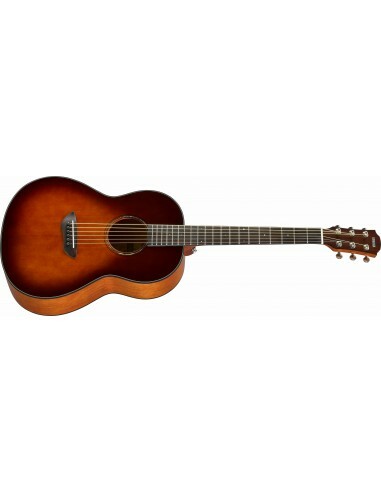 The Yamaha CSF1MTBS is a parlour-style acoustic guitar that harkens back to the early twentieth century. In a time where travelling guitarists roamed the country, these players performed for whatever audiences they could find, sitting in with other acoustic players of the era. It conjures this period in American music beautifully, and at a great price. With a solid Sitka spruce top, the CSF1MTBS has a robust projection and a beautiful tone, kicking out pristine high-end and stellar mid-range. Laminated mahogany back and sides add a layer of low-end warmth for great tonal balance, paired with a rosewood fingerboard and bridge that also adds some depth.